Augusta Talbot was born in New York City. She traveled and studied in Greece 1968-1969. She attended the Maryland Institute of Art, 1969-1971 and the Tyler School of Art in Rome, 1971-1972. She received a BFA in painting from the Tyler School of Art in Philadelphia in 1973. Talbot has exhibited in museums and galleries across the country. She had solo exhibitions at Vanderwoud Tannanbaum Gallery in New York City in 1987 and 1990. Her work has been in numerous group shows including The Sculpture Center in New York City, The Contemporary Arts Center in Cincinnati, Ohio, The John Michael Kohler Arts Center in Sheboygan, Wisconsin, The San Francisco Craft and Folk Art Museum, and Braunstein Quay Gallery in San Francisco. Her work has been reviewed in The New York Times, Art Forum, The Village Voice and American Ceramics, among other publications. Born in Manhattan, poet and translator Michael Palmer has lived in San Francisco since 1969. He has worked extensively with contemporary dance for over thirty years and has collaborated with many visual artists and composers. His most recent collections are At Passages (New Directions, 1995), The Lion Bridge (Selected Poems 1972-1995) (New Directions, 1998), The Promises of Glass (New Directions, 2000), and Codes Appearing (Poems 1979-1988) (New Directions, 2001). A prose work, The Danish Notebook, was published by Avec Books in 1999. A new collection of poetry, Company of Moths, will appear in Spring 2005. Among his awards, Palmer has received a Guggenheim Fellowship, a Lila Wallace - Reader's Digest Fund Writer's Award, two National Endowment for the Arts grants in poetry, and the Shelley Memorial Award of the Poetry Society of America. From 1999 to 2004, he served as a Chancellor of the Academy of American Poets. For the past two years, he has been a Visiting Professor in the School of English, Creative Writing and Philosophy at the University of Cardiff. A few themes have preoccupied me and been apparent in my work since I started drawing as a child. One is burial, both literal and figurative, its ornaments and attendant rituals, its gestures toward closure, and its unearthed relics. Another is how we derive metaphors of process, structure and duration, likeness and difference, from images and phenomena in nature. A third is how light and shadow alter the dimensions and surfaces of material objects. 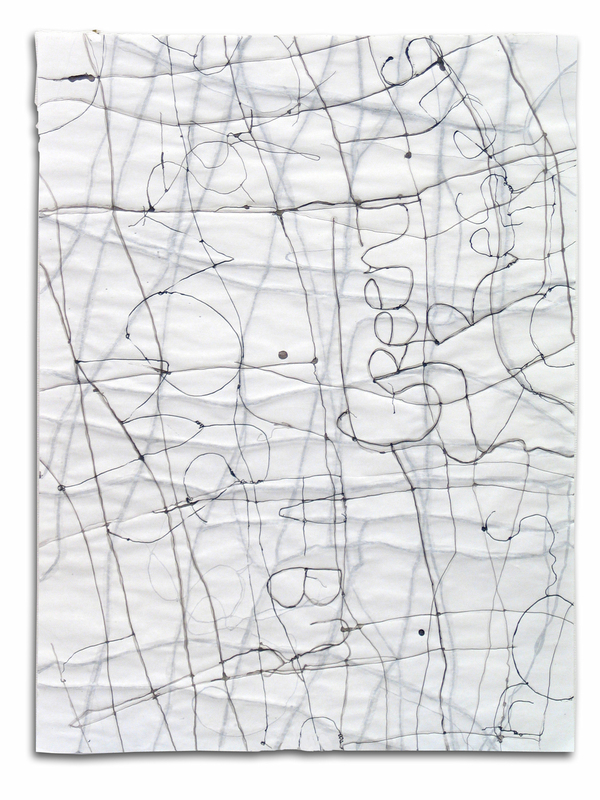 Over the past couple of years, the interrelated series of sculptures, drawings, encaustics and 'wire drawings' have continued to reflect these interests. The boundary between abstraction and the figure is a constant tension in my work. I want to evoke a world that addresses uncertainty and obscurity but at the same time has its own clarity. I do this by juxtaposing, layering, partially burying and veiling images, objects, and lately, words and language fragments. I use a variety of seemingly incompatible materials such as beeswax, paper, wire, fabric and cement. They are natural products that have been employed for centuries to encase, enshrine, wrap, seal and record history. Because of their ancient applications, I feel they bring with them silent echoes and resonances from the past. Shadows cast by my work create a distorted "twin"; another presence that takes on a life of its own but at the same time can only exist in the company of its double. Space, light and shadow are the immaterial materials that are revealed at the time of installation. My drawings are not specifically sketches for the three dimensional work, but inform my thoughts and ideas about the sculpture. Having followed with great interest the evolution and growth of Augusta Talbot's work for over a decade, it is my real pleasure to introduce it here. In an age of noise, Talbot fashions pieces that seem to hold silence and enigma close, in order to create a space of reflection. Yet there is an evident dynamic at play in the form of a series of layered, silent conversations among the constantly metamorphosing components of her art. The wire armature of a free-standing sculpture nearby will reappear in flattened form in a wall work across the room, and then reappear once again as a kind of spidery writing or drawing within a third piece. What reads as a protective, enfolding skin in one work will read as a carceral shell in another, implying that a structure that shelters may simultaneously entrap. A cocoon will metamorphose into a skiff, the skiff into a restless, relief grid, the grid into a ladder, the ladder into an elaborate, crawling insect, all sharing the same bones. Concurrently, the work is determined to interrogate the problematic boundary between abstraction and representation, even as it explores the "meaning" of natural and human-made forms and tacitly subverts the categorical distinction between them. It would be tempting to call this process analytical, if it were not so evidently visceral and improvisational, the result of a wondering and unsettled, if probing, gaze. As there exists a conversation among the forms, so among the materials: wax and wire and wood, sisal and silk, concrete, paper, charcoal, oil crayon, watercolor, light and space. A form that is translucent, open and legible in one instance becomes opaque and impenetrable in another. A whole is transfigured into a remnant, a remnant into a void. Growth and decay, the solid and the evanescent, all interdepend. At one scale and texture, one meaning, at another, an entirely different resonance. In one variation, light is absorbed, in another cast back. Accordingly, the space between objects, and the shadows they project in varying lights, becomes critical to this dance. If at first certain pieces seem reluctant to disclose themselves, in the company of others their manifest, exploratory logic, or language, grows increasingly evident and available. Their privacy denied, they become communicative, almost voluble, and the exchange is there to witness and overhear, and to add a voice if so moved.